Werewolf legends reach back to the Golden Age of Gaia. Garou still gather around the campfire today, even as tribe fights tribe and the Wyrm slowly devours the world. 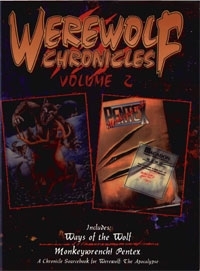 Now you can relive some of the greatest Garou legends with Werewolf Chronicles Volume 2, a compilation of the first Werewolf stories ever told. Werewolf Chronicles Volume 2 combines the original Werewolf manifestos against the Wyrm and the corruption of humanity, Ways of the Wolf and Monkeywrench! Pentex. Now they're under one all-new cover. These classics have been out of print for years and can't be found anywhere else. Details on how to strike back at Pentex, the modern embodiment of the Wyrm. Take the fight to the enemy's door.